If you love stories set in the Wild West, you'll enjoy the third book of the Sherlock and Me series. Set in Reno, Nevada and nearly Pyramid Lake on the Paiute Indian Reservation, the story features Lucy James, newly minted PI. She's been hired to find a missing truck driver and a missing horse. The first case takes her into the shadowy world of truck cargo thefts and the supernatural is involved with the second. A beautiful horse belong to a special needs child is spooked during a thunderstorm one night and disappears on the high desert landscape of Pyramid Lake, an ancient lake filled with secrets and myths. An experienced truck driver never makes it to his intended destination on his route creating panic for his new fiancé. Lucy tackles both cases as always--with deductive reasoning like her mentor, Sherlock. With support from her faithful roommate, Cindy and trusty dog, Baskerville, the mysteries unravel the deeper Lucy goes. She still works part time at the local movie theater but her PI license is hanging on the wall now and her gut instincts are as sharp as ever. 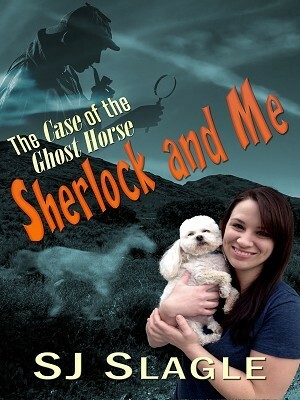 She will do what needs to be done to find the little boy's horse and her new friend's fiancé. Irrepressible. Tenacious. That's Lucy James.